10, With piezoelectric print heads machine and heat transfer Equipment and thermal transfer paper, you can transfer personalized design to packaging, mugs Porcelain, Tiles, Tents, Flags, T-shirt, all kinds of promotional gift and artwork. 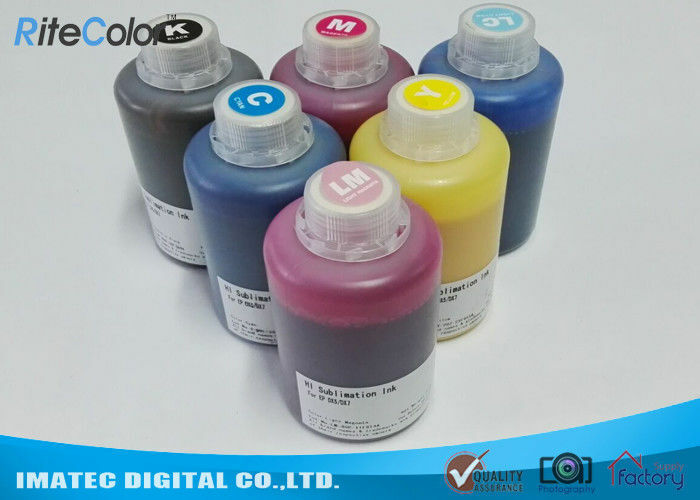 Sublimation ink is suit for Epson/ Mimaki/ Roland/ Mutoh etc with Epson Printerhead DX4, DX5 and DX7. It can transfer into Polyester, Nylon, Polyurethane etc, and hot transfer into Metal, Plastic, Carpentry etc, materials with coating. 2. Ink shelf-life is above 18 month when stored as above. 3. Care must be taken to avoid contamination of inks and substrates. 4. Check that the preheat settings are as recommended. Q: How can I confirm what kinds of Inks I should buy? (3) What is the whole printing process flow? Q: How about the goods package? Is ther customized OEM Packing and logo acceptable? A: Yes, Sure! We supply normal OEM Packing for free. You need just inform us your logo and packing information in details. We will do it for you. Q:​Is it safe for the bottle (Inks and Ink cartridge) during the shipping delivery? A: Don't worry, we will do enough safety testing before shipment. And all the bottles and ink cartridges with aluminum sealed shim. A: Usually 3-7 days after the payment (deposit). This time includes production time, and testing time before leaving factory.